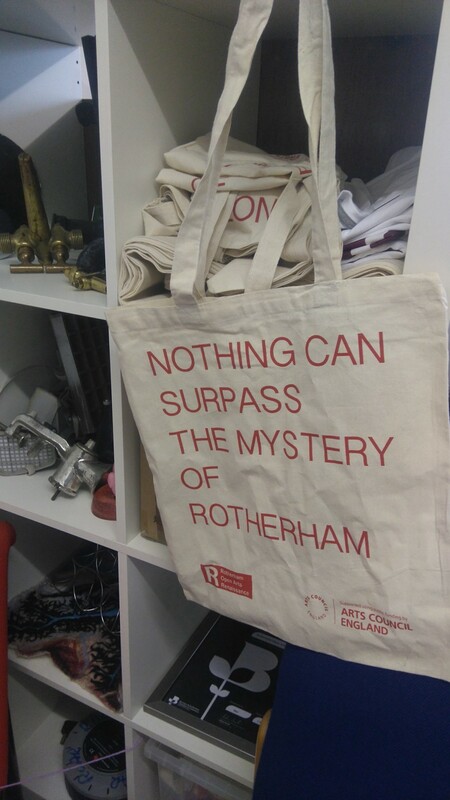 Before starting work here at the beginning of May, Rotherham was really quite a mystery to me. I remember talking to a woman at the job centre before my interview who was born in Sheffield, but lived in Rotherham; she felt she had a particularly useful insight into the two places. She shed light on some of the differences between them, stressing how Rotherham used to be the more prolific of the two towns, but how with time, it became overshadowed by Sheffield. This assertion in many ways rings true to what I have discovered since working at ROAR. In terms of the arts, Sheffield takes much of the limelight, similar to other prominent cities in and around the region like Leeds and Manchester. Having impressive university’s and art colleges, there is already a well established artistic hub to tap into. In Rotherham, even though there is a valuable arts scene and artists, there isn’t the same level of infrastructure to support it. At the start of our AGM last month, Tamar Millen gave a talk on Sheffield’s Year of Makers. With the focus being on the Steel City, questions began with how artists within Rotherham could get involved. After a general discussion on how much of Tamar’s role is about bringing the right people together, Sharon (our CEO) made a comment that has played on my mind since. She explained how Rotherham must look to create a new narrative for itself, as Sheffield has done with the Year of Makers. The use of the word “Makers” is really interesting in terms of how towns and cities can engage with their past industries to re-direct their future, especially in terms of the arts. I had never really thought about how these industrious trades directly link to the creative process, but in the end you are working with materials in order to make something, whether it be at a steelworks or in an artists studio. I think by continuing to make this connection, tapping into the past cultural and social make-up of towns like Rotherham, the overall view and appreciation of “the arts” will grow stronger.